I love making recipes like this one around the holidays. 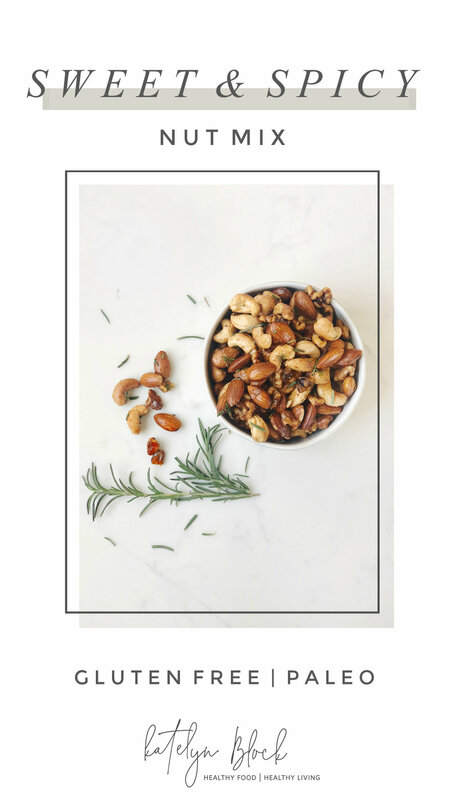 These nuts make a great homemade gift and are a wonderful addition to an appetizer board! The sweet and spicy combo is perfect and you can feel good about this recipe because it isn’t loaded with sugar. Only slightly sweetened with some coconut sugar, and feel free to adjust the cayenne pepper to your liking! You can also switch up the types of nuts in the recipe, or use whatever you have on hand! This recipe comes together so easily! Preheat oven to 350 degrees. Place raw nuts on a baking sheet and roast for 10 minutes, until golden brown. Toss halfway through. While the nuts are cooking, combine the remaining ingredients in a large bowl. Toss roasted nuts into the bowl and stir to combine until all of the nuts are coated. Serve warm or at room temperature, but they are really good warm!